This paper first appeared in The Journal of Children's Literature Studies, Volume 7, Issue 3, 2010. In writing the trilogy His Dark Materials Philip Pullman has stated that part of his wish was to undo the ‘profoundly world-hating view’ expressed in C.S. Lewis’s The Chronicles of Narnia. The comparison between these two sets of novels is a well trodden path, but this paper shall attempt to shed some new light on old arguments. The fantasy genre is well understood as one used to approach the contemporary world. This paper looks at how the alternative worlds created by Pullman and Lewis comment on each authors own contemporary worlds, and the extent to which Pullman achieves putting forth a more positive view of the world than Lewis. In an interview after the publication of all three novels comprising the His Dark Materials (HDM) trilogy, Pullman said of Narnia, ‘there is a profoundly world-hating emotion behind these books… [of which] I feel almost the reverse. This world is a most precious place. We shouldn’t hurry to get out of it, we should cherish every moment that we have here.’ (The Southbank Show, 2003) In HDM we find several areas of very deliberate challenge to this negative world view, and by closely comparing the trilogy with Lewis’s The Chronicles of Narnia (hereafter The Chronicles) we can reveal the extent to which he achieves this. A notable difference between the novels is the degree of power with which each author equips his child protagonists. In Narnia, Lewis’s children sometimes become rulers, (The Lion the Witch and the Wardrobe) and fight battles against enemies of Narnia. However, they are frequently either accompanied by an ‘adult’ figure, or seeking the assistance of someone else. At the end of The Chronicles, when the world of Narnia is threatened with collapse, the onus for salvation ultimately rests upon Aslan. The child protagonists are rescued from this world in crisis, to go somewhere better. Across the trilogy the child characters are frequently unaccompanied, though not always and notably, at the end of the Amber Spyglass, Pullman’s child protagonists, Lyra and Will, return to their worlds with the power and responsibility to make change. The onus for salvation therefore ultimately lies with the individual. As a Christian, Lewis firmly held the belief that humans are born with sin and that one of the basic purposes of life is to purge that sin and gain a place in Heaven in the afterlife. Burton Hatlen draws attention to Lewis’ doctrines as an ecumenical Christian, notably, ‘the fall of human beings from an original state of perfection as a result of their wilful disobedience of God’s commands... [and]... eternal life in heaven as the reward of all who accept Christ as their saviour.’ (Lenz, 2005, 80) Early in The Magician’s Nephew, (the first book taken chronologically), Digory and Polly enter the world of Charn. They find a bell and Digory strikes it awakening the evil Empress Jadis, who follows them into Narnia. In doing so he has brought evil into Narnia. Though Narnia remains a place of innocence directly after the reworking of the fall myth later in the book, Digory’s sin (temptation) will not be without consequence. When Aslan discovers what Digory has done, he says, “before the new, clean world I gave you is seven hours old, a force of evil has already entered it; waked and brought hither by this son of Adam… Evil will come of that evil, but it is still a long way off…” (MN, 126) Lewis indicates here the essential downfall of Narnia owing to this one act of weakness. At this point no action is taken by the characters to attempt to prevent this evil that will come. Across The Chronicles there are many battles to be fought, by both the child characters from our world and by the people of Narnia. They are constantly fighting against evil forces (always from without Narnia), but there is a certain fatalism implicit in the attitude adopted by Aslan here. Lewis suggests at the inevitability of human corruption. When this evil first enters the world of Narnia Lewis does not equip the children with the power to defeat her, instead we see the authority figure tell the children that though great evil will come of what they have done, there is nothing they can do about it. In The Last Battle the waning faith in Narnia has opened it to corrupt forces. At the climactic point of this disbelief the dwarf Griffle says, ‘We’ve no more use for stories about Aslan…’ (LB, 71) The doubt in Aslan’s existence has spread though Narnia and is shown as the cause of corruption; Lewis’ vision of a corrupt world is one without faith in a saviour. Chad Walsh draws parallels between the history of Narnia and our world; he says this corresponds to ‘the present world, with its confused struggle of good and evil…’ (Walsh, 1979, 146) Lewis consistently points to the dangers of a world without faith in Christ. At this vital crossroad, the protagonists are rendered completely powerless; the only chance of hope is for Aslan to return and save them. When Aslan does return, the solution to the corruption is to ‘cleanse’ Narnia. The final judgement scene is a purging of evil from Narnia so that the good can move on into ‘everlasting Narnias’; the Narnia which the good characters enter is even better that the one before. This cannot but render the child protagonist impotent; despite the opportunities the other children in The Chronicles have had to physically fight evil, at this point of political and ideological decay there is nothing to be done. The only solution is to desert the present world of Narnia and move into a new one. Furthermore, in the ‘judgement scene’ where Aslan separates the good from the evil, the ‘good’ characters who go on into ‘everlasting narnias’ are the ones who have had faith in Aslan. The final scene in The Last Battle does show good triumphing over evil, however the protagonists are not empowered to make this change for themselves, they are reduced to only needing faith in a saviour who will rescue them from crisis. Though this fatalism might be reassuring within the world of Narina, Pullman takes issue with this and deliberately empowers his child characters with choices and decisions which will steer their destiny. He makes a deliberate and explicit bid to empower the individual. This is not to suggest that there is not a degree of fatalism in HDM. Fatalism plays an important role in the trilogy: Lyra is consistently guided by the Alethiometer; Will is ‘chosen’ by the subtle knife as the bearer; the witches prophesise a female child who will be of great significance, as indeed Lyra turns out to be. However, what Pullman does do is to empower the characters with the power to make their own decisions and importantly with the power to actually make change. Where characters, and especially the child protagonists, find fault with their world Pullman suggests implicitly and directly that they are able to change it. Across the entire trilogy, the very scale of Lyra’s quest into the land of the dead to fulfil her promise to her friend Roger underpins the idea that individuals have the power to follow their own course. Lyra is determined to find Roger and keep her promise, and she is further equipped with the powers to find a way there, and to persuade those in charge to allow her to go. This ethos is further reinforced by Lyra and Will’s joint plight and the organic development of their journey. As they travel and discover new pieces of information, we constantly see Lyra and Will confronted with difficult decisions to make, weighing up their moral obligations against their own wishes in order to make those decisions. In fact there is a strong emphasis placed on the importance of ‘choice’ across the trilogy. In The Subtle Knife a seal-hunter, explaining the difficulty of love between a man and a witch, says, “It’s like having to make a choice, a blessing or a curse. The one thing you can’t do is chose neither.” (SK, 123) In The Amber Spyglass the importance of choice is highlighted again, “At the moment, all Will’s choices existed at once. But to keep them all in existence meant nothing. He had to choose...” (AS, 15). There is a constant emphasis on ‘choice’, underpinned by a certain degree of power. The mere fact that the characters have choices and the seriousness with which the decisions are made shows the characters in control of their paths. The responsibility assumed by Lyra and Will - not only to complete their journey and the constant new battles which they fight as they travel, but to continuously make the ‘right’ decisions’ - further reinforces this ethos. At the end of the trilogy, Lyra and Pantalaimon discuss their new mission: to build their own Republic of Heaven. The protagonists are given the power to do this, but also the responsibility of achieving it. Pantalaimon says, ‘We have to be all of those difficult things like cheerful and kind and curious and brave and patient, and we’ve got to study and think, and work hard, all of us, in all our different worlds.’ (AS, 548) This final point, with the repetition of ‘all’ indicating the power of the reader as well as the characters, empowers the individual, whilst deliberately re-writing the rejection of reality as seen at the end of The Chronicles. Pullman takes particular issue with Christian eschatology and reverses images of heaven and hell to make a more constructive and positive view of life in HDM. At the end of The Amber Spyglass, when talking about heaven, Lyra says, ‘We shouldn’t live as if it mattered more than life in this world, because where we are is always the most important place.’ (AS, 548) In saying as much, Pullman is working to create the reverse philosophy of that created at the end of The Last Battle. This view of the world as easily disposable, in favour of the afterlife, is a view which many critics have taken issue. Chad Walsh sees it as a rejection of Lewis’s own contemporaneity, a post-war Europe faced with economic, political and social crisis. Pullman similarly takes issue with this, and on a broader scale, with the whole concept of Christian eschatology. Pullman says, “It’s not honest storytelling: it’s propaganda in the service of a life-hating ideology.” (The Dark Side of Narnia, Pullman, 1998) The idea of death and heaven, as preferable to life and the material world is tackled explicitly in HDM. In the trilogy, ideas of heaven and eternal, blissful, spiritual afterlife are presented as deeply inferior to the joy of material life. For Pullman, a self-professed agnostic, this is not surprising, but Pullman goes to great lengths to not only deconstruct a Christian idea of heaven, but to construct a positive view of the world and the physical, material pleasures it offers. 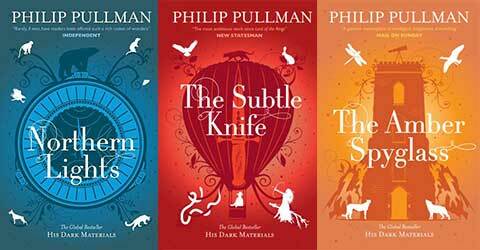 Drawing on and inverting images of heaven and hell, Pullman strives to express a world-loving view in the books. His underworld of souls who are caught in perpetual, spiritual existence is a powerful image set to contrast the Christian view of the afterlife as eternal bliss. The ghosts in the world of the dead are weak and desperate ‘they could only whisper’ (AS, 311) and they yearn for the power and warmth they once had as physical beings, they ‘…crammed forward…to warm themselves at the flowing blood and the strong-beating hearts of the two travellers.’ (AS, 311) Balthamos tells Will that the world of the dead, “is a prison camp,” (AS, 35) and Baruch says, “Everything about it is a secret. Even the churches don’t know; they tell their believers that they’ll live in Heaven, but that’s a lie.” (AS, 35) Pullman shows the souls in the underworld aching to rejoin the world and be part of it again. This celebration of the material world and physical pleasure is an assertion of the validity of earthly life in contrast with the view expressed by Lewis at the end of The Last Battle. Pullman reinforces the idea that earthly life should be cherished and that the Christian view of eschatology denies and depletes that pleasure, on several levels. As Will and Lyra leave the world of the dead and rejoin the earth they are seen to indulge in this as a tangible physical pleasure. Pullman creates a stark contrast between the grey emptiness of the world of the dead and the sumptuousness of the world: ‘…Will and Lyra fell exhausted on the dew-laden grass, every nerve in their bodies blessing the sweetness of the good soil, the night air, the stars.’ (AS, 382) Pullman’s trilogy shows the material world and physical life as sacred and beautiful, but above all to be treasured and enjoyed. In turn the afterlife, or spirit life, is shown as inferior to that of the flesh. This celebration of mortal, physical life is taken to an even deeper level by the representation of the witches. The witches pity the angels: the earth literally thrills the witches’ senses and their sensitivity to the material world is much cause for celebration. As the witch Ruta Skadi flies through the air after a group of angels she is seen to relish her physicality. She felt a fierce joy possessing her…she rejoiced in her blood and flesh, in the rough pine bark she felt next to her skin, in the beat of her heart and the life of all her senses, and in the hunger she was feeling now, and in the presence of her sweet-voiced bluethroat daemon, and in the earth below her and the lives of every creature, plant and animal both; and she delighted in being of the same substance as them, and in knowing that when she dies her flesh would nourish other lives as they had nourished her. Pullman draws on the past, present and future for his imagery, without direct comment. His settings display a deep concern for his contemporary world and his imageryis drawn frequently from reality. Not only do these settings comment on the world but, in using evocative images from reality, Pullman brings with them the associated emotional connections from reality. However, whilst Pullman does not explicitly negate the present, he draws heavily on negative contemporary images to add richness to his settings, and less frequently on positive contemporary images. Here and there, fires had been lit among the ruins. The town was a jumble, with no streets, no squares, and no open spaces except where a building had fallen. … Between the shells of the stone buildings, a mazy clutter of shacks and shanties had been put together out of lengths of roofing timber, beaten-out petrol cans or biscuit tins, torn sheets of polythene, scraps of plywood or hardboard. This refugee town is a holding place for the dead before they move onto the final land of the dead. This camp summons images of refugee camps from the contemporary world and brings with it the same sense of restless yet permanent homelessness. The despair and depravity of images from real refugee camps brings to this setting in the fantasy world a borrowed but fitting understanding. By drawing on real images, Pullman is able to evoke an even more powerful landscape, one which is in direct reference to reality. However, he also reminds the reader of those negative aspects of reality. In The Northern Lights Pullman again draws on negative imagery from reality. Lord Asriel tears a hole in the fabric of his world creating an opening into another world. In doing so, the natural stability of the earth is disrupted and the polar ice caps begin to melt. Pullman clearly draws this from the particularly topical contemporary issue of global warming and the actuality of the ice caps melting. Pullman utilises contemporary images of natural disaster to bring epic proportions to his fantasy in the language of the modern world. The convulsion has affected the earth differently in different places, Will saw; village after village stood up to its roofs in water and hundreds of dispossessed people tried to salvage what they could with rowing boats and canoes. Furthermore, the images which he draws on are ones easily recognisable to his contemporary readership carrying with them real meaning and consequence. In the vast caverns beneath the rearing walls provisions of every sort were stored and labelled; in the arsenals and magazines, engines of war being calibrated, armed and tested; in the mills below the mountain, volcanic fires fed mighty forges where phosphor and titanium were being melted and combined in alloys never known or used before. This image of preparation for war, which rather reminds the reader of Saruman’s preparations for war in Tolkien’s Lord of the Rings (1968), is surprisingly derivative considering the founding concept that this is a unique war, however we also see dangerous experimentation; new alloys being formed. We are reminded of the dangers of defence research and development, the threat of which dominates modern international politics. Pullman draws to attention negative aspects of his own reality, employing them to add meaning to his narrative, but implicitly negating reality in doing so. Further to this, he frequently employs timeless, pastoral settings, just as Lewis does, for positive scenes. Lewis uses pastoral settings as preferable to cities without exception. Narnia is an almost entirely natural country with few buildings and no towns. It is not until The Last Battle that any towns are actually mentioned in Narnia, ‘When they wanted anything from the towns further down the river it was Puzzle who went down with empty panniers on his back…’ (LB, 7) In turn, Narnia until this time has been a place of perfect natural beauty and idolatry, evil forces coming from without. Interestingly Narnia’s demise is synonymous with the destruction of its natural landscape. Tirian discovers that Calormenes are cutting down the Dryads: his ‘grief and anger were so great he could not speak.’ (LB, 21) The destruction of the natural landscape is described as ‘the worst thing in the world,’ (LB, 24) and where the trees have been torn down ‘a hideous lane like a raw gash in the land…’ has appeared (LB, 24). In keeping with this alignment of pastoral setting with perfection and happiness, is the corruption and evil of the city in The Horse and His Boy. The city of Tashban is greatly feared and a place of peril from which the protagonists of the book escape. It is also dirty and crowded, full of undesirable people, ‘soldiers, beggars, ragged children, hens, stray dogs, and bare-footed slaves…unwashed people, unwashed dogs.’ (HHB, 50) This negative view of metropolitan settings is also seen in Pullman’s work. Cities are often employed as the setting of corruption. The city of Citagazze in The Subtle Knife which is infested with soul eating spectres is the place where the knife was made and where the corruption which it has brought was also born. Though not all of the urban settings in Pullman’s work are negative settings, a great many are. For though Pullman tends to confront contemporary issues, there is a sense of preference for pastoral settings in his work as much as there is in Lewis’ work. At the climactic point of the trilogy, where Lyra and Will re-enact the second ‘fall’, the natural, pastoral setting is an edenic paradise. The open country and absence of buildings or urbanisation implicitly conveys a negative view of the mark that man makes on earth. Pullman radically challenges some negative aspects of Lewis’ ideology. His re-writing of Christian eschatology goes a long way in providing a positive secular/humanist metaphor for the afterlife. Through empowering the individual, Pullman says that you can change the world, but in saying as much, he implicitly points to the need for such change. Pullman preaches that life is good, positive and that our one chance at it should be relished, however, he does not necessarily present an entirely loving view of the world in which we actually live. Catherine Nicholson, Wendy Parsons and Pullman, Philip. “Talking to Philip Pullman: An Interview.” The Lion and the Unicorn 23.1 (1999): 116-34. Rpt. in Children’s Literature Review. Vol. 84. 39-48.